In stock -This product will ship today if ordered within the next 4 hours and 52 minutes. Replaces BioCare Junior B Complex! BioCare B Complex 25 is a low potency B complex supplement containing B vitamins and associated nutrients, B Complex 25 is also suitable from 5 years of age and the capsule can be opened if necessary to administer as a powder. Can be used for children between 5 and 14 years of age. Easy to swallow small capsule. Vitamins B6 and B12 are presented in their biologically active forms. Vacuum packed to reduce oxidation of the B vitamins. Vitamins B2, B6, B12, C and Biotin contribute to normal functioning of the nervous system. Vitamin B1, B3, B6 and B12 contribute to normal psychological function. Vitamin B1, B2, B3, B5 and B6 contribute to normal energy-yielding metabolism. Vitamin B2, B3, B5, B6 and B12 contributes to the reduction of tiredness and fatigue. Vitamin B6, B12, folic acid and vitamin C all contribute to the normal function of the immune system. Capsule Shell (hypromellose), Bulking Agent (Cellulose), Vitamin C (as Magnesium Ascorbate), Thiamine (as Thiamine Hydrochloride), Vitamin B6 (as Pyridoxal-5-Phosphate), Pantothenic Acid (as Calcium Pantothenate), Riboflavin, Niacin (as Niacinamide), Inositol, Para Amino Benzoic Acid (PABA), L Glycine, Anti-caking Agents (Silicon Dioxide & Magnesium Stearate), Biotin, Folic Acid, Vitamin B12 (as Hydroxycobalamin). Take one capsule taken daily with food or as professionally directed. Suitable from 5 years of age. 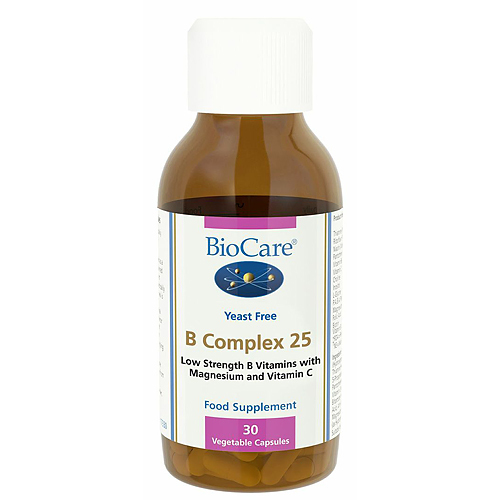 Below are reviews of B Complex 25 - Low Strength B Vitamins - 30 Vegicaps by bodykind customers. If you have tried this product we'd love to hear what you think so please leave a review.